Do you have New South Wales ancestry? Almanacs are a valuable resource for local, family and social historians as well as for researchers in other fields of Australian history. 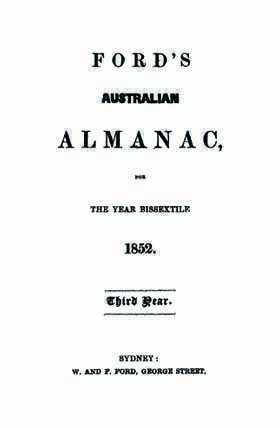 This Ford’s Australian Almanac, which is largely about New South Wales, is divided into two sections, the first containing information from England on the royal family, the government, the army and more. The second section contains information on government directories, laws, ecclesiastical, banks, military establishments and societies from the colony of New South Wales. It also includes information on acts, postage rates and the 1851 New South Wales census. This is a great genealogy resource for anyone exploring their family history, or if you're putting together your family tree.